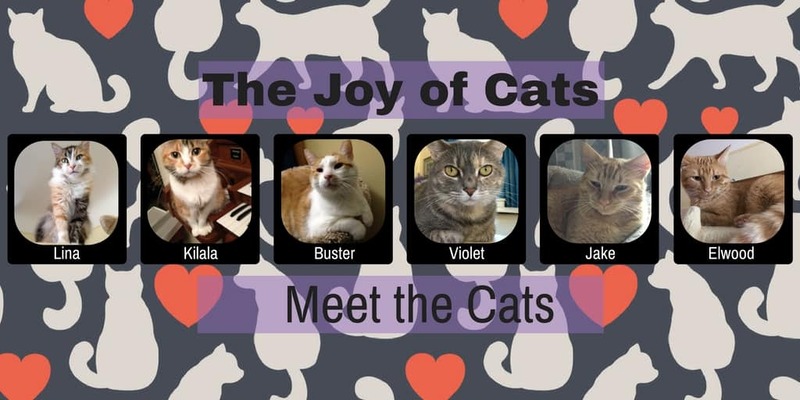 Here are some highlights of our nine cats. Each cat brings us joy in their own way! Their names below are links to an individual page providing more information about them and their story. We adopted our first 2 cats (Lina and Kilala) in Spring 2003 from a friends barn. Their stories will focus on their life since moving in with us. In January 2011, we took in Buster from our yard. He was our first rescue from the yard. Buster: Our most friendly cat, not related to any of our other cats (possibly related to "Other Buster" mentioned in Violet's story). In July of 2014, Violet brought 5 kittens to our yard. We took her in keeping 2 of the kittens (Jake and Elwood) and found homes for the other 3 kittens. We had to socialize all of the kittens! Violet: Originally known as Cat Mom, rescued from the yard. Her story includes the story of Other Buster, a feral cat we fed for a couple of years. J﻿﻿ake: Son of Violet, purrs easily, likes to sit on couch with the humans. Jake and Elwood's story of coming to live with us the same and they are also twins. As a twin myself (I have a twin brother), I felt it was important for them to have their own page instead of grouping them together.We sometimes refer to them as "the twins" or "the kittens". They are no longer kittens, but we still call them that sometimes. Taco is our seventh cat and is another rescue. He was found when about 2 months old in my sister's yard by her dog in November 2016. He had a terrible eye infection. Nacho, cat 8, was born in the yard to a feral cat named Chloe in the Summer of 2017. Nacho and her 4 siblings were socialized after they were weaned. We kept Nacho, and the other 4 were rehomed by our local Humane Society. Charlotte became our ninth cat as a foster fail in the summer of 2018. My friend was moving and unable to take Charlotte. The plan was for Charlotte to go to a barn, but that didn't work out. I decided to foster Charlotte in my garage in a pet playpen. After just two days, Ted (my husband) decided we would keep her. We currently have 3 cats in the yard coming for food. Midnight and Charcoal take shelter in the shed. Pork Chop may be using the shed or one of the other shelters in the yard. He is more feral than the other two. There have been many other cats that have been in the yard in the last two years I did TNR for. Midnight, was already ear-tipped when he showed and doesn't have canine teeth!